Poem on divination. Written by RH Ahmed Tabib, 1915. 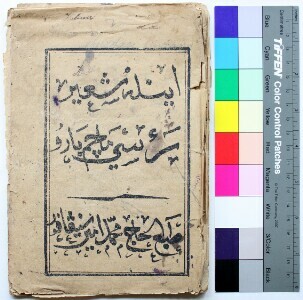 Loose binding but still complete; lithographed edition published by Haji Muhammad Amin Singapura, no. 7 Bagdad Street (has a seal impression at the back); back cover contains an illustration of a flower pot, which has been coloured in. Two other poems also may be found in the book. "Surat Kepada Tengku Abu Bakar [Singapura, 8 November 1923]"
Left margin damaged; several notes on verso. Author unknown.